We all lose about 50 – 100 strands of hair every day, but many people suffer from more intense hair loss, also known as alopecia. Causes for alopecia include pollution, nutritional deficiency, infection, chemically-enriched hair products or cosmetics, genetics or heredity, hormonal imbalance, split ends, smoking, stress, aging, medication, or medical conditions like PCOS, iron deficiency, autoimmune diseases, and thyroid disorder. There are several ways of using natural home remedies to treat hair loss. But they take time to show you the results. Meanwhile if you want to cover up the thinning hair, then you can use hair concealers. Here are our favorite picks after researching and trying many brands available in the market. Quick Tip: After trying out any treatment, while rinsing your hair, make sure to use a hair loss shampoo that is designed to restrict hair loss and doesn’t contain any harsh chemicals. Massaging your scalp reduces hair loss, increases blood flow to hair follicles, conditions your scalp, and strengthens the root to grow properly and quickly. This process reduces stress and promotes relaxation. This also prevents dandruff, allowing hair to grow healthy, smooth, and shiny. Use any carrier oil like coconut oil, almond oil, olive oil, castor oil, amla oil, etc. Add few drops of rosemary oil to carrier oil. Apply to hair and scalp and massage gently with finger tips. Mix the above-mentioned ingredients and shake well. Wash hair with shampoo and dry partially. Apply a few drops of this mixture to towel-dried hair and massage. Shake the bottle before using next time. Note: Alternately apply any of these carrier oils to the scalp individually, if desired. Indian gooseberry or amla is an Ayurvedic remedy which effectively prevents hair loss and promotes hair growth as it is rich in vitamin C and iron. It also contains anti-inflammatory, anti-oxidant, anti-bacterial, and other exfoliating properties that maintain a healthy scalp. Mix 1 tablespoon of each of gooseberry or amla pulp and lemon juice in a bowl. Apply to scalp and massage for few minutes. Wrap head in a shower cap and leave overnight. In the morning, rinse and shampoo hair. Boil 1 cup of coconut oil for 3 – 5 minutes. Add the dried gooseberry pieces and boil until dark. When cool, apply to scalp and massage. Or Soak amla pieces in water overnight (if possible use iron vessel). Use this water as a final rinse after shampooing. Fenugreek is a highly-effective remedy used to treat hair loss. It has hormone antecedents which promote quick hair growth. It also contains proteins and nicotinic acid that rebuild hair follicles, making hair grow naturally without any chemicals. Apply to scalp and massage. Wrap head in a shower cap and leave for 40 minutes. Onion juice has high sulfur content that improves blood circulation to hair follicles, regenerating them without inflammation. It has anti-bacterial properties that kill parasites and germs that cause scalp infections and hair loss. Leave for 30 – 40 minutes. Note: You can apply onion juice by itself to the scalp, if desired. Both onions and garlic contains sulphur which increase collagen production, strengthening and growing hair. This is a traditional method for hair re-growth as coconut oil is natural moisturizer and healer. Apply onion juice to the scalp. Wash with mid shampoo and dry the hair. When cool, apply to the scalp and massage for few minutes. Leave for 3 – 4 hours or overnight. Repeat 2 – 3 times weekly for best results. Aloe vera is considered one of the best treatments for health and beauty problems. It has enzymes that promote healthy hair growth by eradicating dead cells that clog hair follicles. Its alkalizing property balances hair’s pH level to prevent infection and other impurities. Using aloe vera regularly will relieve itching and inflammation. It also strengthens hair and prevents dandruff. Apply aloe vera gel or juice to the scalp and hair. Leave on for few minutes and wash with lukewarm water. Or you can use aloe vera based shampoo and conditioner regularly. Or you can consume a tablespoon of aloe vera juice on an empty stomach daily. Mix the above-mentioned ingredients to make a paste. Leave for 8 – 9 hours or overnight. Repeat weekly for 1 – 2 months for best results. Note: Alternately apply aloe vera gel to the scalp 3 – 4 times weekly, if desired. Licorice root is an herb that opens pores, soothes itching and irritation caused by dry flakes, and stops damage to the hair. It treats dandruff, dry scalp, and baldness. Apply to the scalp focusing more on bald patches. Note: You can drink licorice tea three times daily. Hibiscus has many natural properties that help hair loss, promote hair growth, prevent split ends and dandruff, thicken hair, and stop premature graying. Apply to the scalp and leave overnight. Beet root is an essential ingredient used to treat many health and beauty problems. It has many nutrients like proteins, phosphorus, calcium, vitamins B & C, carbohydrates, and potassium which are useful for growing healthy hair. Boil few beetroot leaves in water for 5 minutes. Grind leaves and mix with henna to make a paste. Leave for 15 – 30 minutes and rinse with water. Or drink only beet root or mix with spinach, alfalfa, and carrot juice for added results. Coconut milk has essential fats and other proteins to grow healthy hair follicles. It gives quick results when applied by nourishing hair tissue. Boil freshly grated coconut in water for 5 minutes. Note: Add black pepper and powdered fenugreek seeds to the mixture for added results. Egg has a rich amount of Sulphur, proteins, and minerals like iodine, selenium, iron, phosphorus, and zinc that act as an excellent hair promote, allowing healthy growth. Rinse with cool water and shampoo hair. Yucca plant is Native American used to prevent hair loss. Use the root as a powder or add it to your regular shampoo to prevent hair loss. Alternately use the root as you would regular soap for added results. Just be sure to remove the outer brown layer. Blend 1 tablespoon of yucca root powder and 2 cups of water to make a paste. A proper diet prevents many health issues and is the best foundation for a healthy body and hair. Follow these tips to make your diet healthier. Omega-3 Fatty Acids: This nourishes hair follicles which leads to hair growth and prevents hair loss. This treats dry, itchy skin, dandruff, and hair breakage by making hair more elastic so it doesn’t break easily. Find omega-3 fatty acids in foods like walnuts, salmon, soybeans, sardines, and flaxseeds. Mix flaxseed in water and drink daily or add flaxseeds to your food. Alternately apply flaxseed oil directly to the scalp and leave overnight. Zinc: This builds the proteins essential for hair and tissue growth. Zinc also regulates hormones to prevent hair loss. Find zinc in foods such as wheat germ, nuts, chicken, lean beef, spinach, pork, sunflower seeds, squash, pumpkin, and seafood. Protein: Hair is made of several proteins which promote proper growth. Protein deficiency can cause hair to turn gray. Protein-rich foods include lentils, eggs, soy, lean beef, beans, white meat (poultry), salmon, milk, yogurt, and cheese. Iron: This carries oxygen to your body. Iron deficiency can lead to poor blood circulation, causing hair and scalp problems. Find iron in foods like red meat, egg yolks, dark green leafy vegetables, turkey, liver, prunes, raisins), mollusks, oysters, clams, scallops, beans, soybeans, chickpeas, and lentils. Vitamins A and C: Both these produce sebum, an oily substance secreted by the hair follicles to treat breakage. These vitamins improve iron absorption and help maintain healthy hair growth. Foods rich in vitamin A include carrots, mustard greens, spinach, sweet potatoes, winter squash, Swiss chard, collard greens, and lettuce. Vitamin C-rich foods include papaya, pineapples, oranges, broccoli, kale, strawberries, bell peppers, kiwi, and Brussel sprouts. Biotin: Our hair is made of keratin and biotin plays an important role in producing it. Biotin deficiency is one of the major reasons for hair loss. It helps to maintain your hair healthy and strengthen the hair follicles. Foods rich in biotin include sea food, dairy products, eggs, soya bean, vegetables, nuts and berries. However, you can also take biotin in supplement form. Indian lilac is considered the best Ayurvedic medicine for most health and skin problems. This has anti-bacterial, anti-fungal, anti-diabetic, anti-viral, antiseptic, and sedative properties that effectively treat hair and scalp problems and infection. Boil 1 cup of crushed neem leaves in 6 cups of water for 5 minutes. Allow it to cool and use the water to rinse hair. Henna is commonly used in Asian countries to strengthen and color hair. It is a nourishing conditioner that makes hair look smooth, shiny, and beautiful. Regular application helps to keep itchiness and dandruff at bay. It also has certain properties that fight bacteria and other germs that cause hair loss. It helps make hair strands thick and strong. Boil 60g of henna powder and 250 ml of mustard oil. Strain mixture using a muslin cloth. Apply to the scalp daily for best results. Or mix henna powder with beetroot juice and curd to add thickness to your hair. Steam is a well-known process that increases blood circulation to the scalp and cleans scalp pores. This also moisturizes the scalp and prevents hair problems by rejuvenating the hair. Dip a towel in hot water, squeezing the excess water from the towel. Cover the hair with the hot towel until it cools down. There are several oils that, when applied directly, offer complete relief from hair and scalp problems. These herbal, essential, and carrier oils must first be diluted with a carrier oil. Coconut Oil: Extensively used in Asian countries, this oil acts as a moisture sealant and nourishes the hair. It also contains lauric acid and anti-bacterial properties that keep infection away. Olive Oil: Rich in anti-oxidants, olive oil provides great nourishment, preventing hair loss. It deeply penetrates to control the hormone DTP. It also has vitamin E and fatty acids that promote hair growth. Almond Oil: Almond is rich in vitamins E and D, iron, calcium, fat, and magnesium which control hair loss. This oil is easily absorbed and controls hair loss. Lavender Oil: Lavender has anti-oxidant, anti-fungal, and anti-septic properties that effectively prevent hair problems. Derived from lavender flowers, this oil treats dandruff, hair loss, and baldness. Jojoba or grapeseed oil can be used as a carrier oil for added results in extreme cases. Rosemary oil: Obtained from rosemary leaves, this oil is widely used to treat many hair problems, especially acute alopecia areta. This oil stimulates hair roots to increase blood circulation, ultimately promoting hair growth. Jojoba, grapeseed, or almond oil can be used as a carrier oil. Geranium Oil: This oil is good for dry and oily hair as it regulates sebum secretion, strengthening hair and leaving it smooth and shiny. Jojoba, grapeseed, coconut, or almond oil can be used as a carrier oil. Always drink plenty of water and eat lots of fresh fruits and vegetables. Regularly massage your scalp to promote hair growth and prevents scalp problems. Practice a regular hair cleaning regimen to remove dust, dirt and other impurities. Avoid harsh chemicals when coloring and styling your hair. Be gentle and prevent all the possible ways to harm your hair. Heat weakens hair proteins which lead to hair loss. Avoid tools such as hair dryers, hot curlers, hair fasteners, hot brushes, and hair straighteners. Avoid tight, low-quality hair elastics. This leads to breakage and hair loss. Use a wide tooth comb with soft bristles to brush hair. Stress is a leading cause of hair loss. Eliminate stress in your life whenever possible. Exercising regularly will keep your body healthy and your stress levels low. Try outdoor games, aerobics, yoga, meditation, breathing deeply, and swimming. Avoid carbonated sodas. Drink fruit or vegetable juice instead. Increase hair thickness by drinking unfiltered apple cider vinegar diluted in water 3 – 4 times a week. Trim hair regularly to promote health. Dead ends are not good for your hair. Have you tried any of these methods? Do you know any other methods to treat hair loss? Share your experience with us! Can hair grow after 8-9 years of balding/thinning for women, if it’s genetic problem ? No, you cannot. 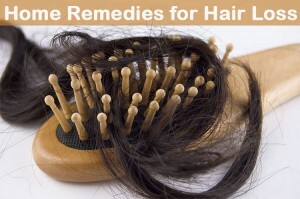 However, with home remedies you can delay the hair fall for some days. Can I do several different treatments in one week? For example I am doing an onion rinse today, and an amla oil mask tomorrow. Must I only do the same ones over and over or can I do a green tea rinse the same week as I do the onion rinse? It is better to stick with any one method because repeating too many methods can hurt the scalp’s health. So choose one method wisely and try it regularly as specified in the article. I have Hashimotos… any specific advice for this? I love your info.